Clicking Take Snapshot on the Snapshots sub menu will cause the Take a Snapshot dialog box to open. It can be used to take a snapshot of the current state of the game. This dialog box is shown to the right. 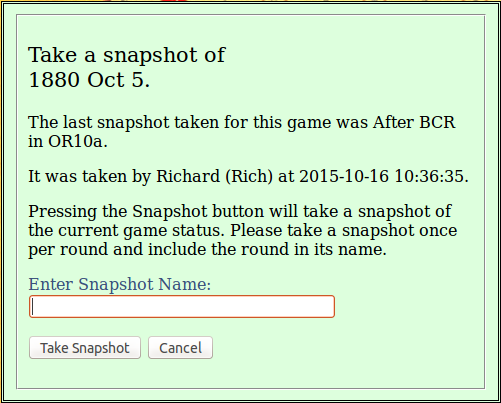 It is recommended that a snapshot be taken every time a new tab is created on the game's spread sheet. For ease of coordination, it is suggested that the snap shot label (which should be placed in the Enter Snapshot Name: field) contain at least the name of the current round. Three BOARD18 pages exist to allow players to make use of existing snapshots. The use of these pages is described below. Selecting "Show Snap List" on the Snapshots sub menu will bring up the board18SnapList page. This page will display a list of all of the snapshots that have been taken for the game so far. This list will be ordered with the most recent snapshots appearing first. And it will become paginated when the number of snapshots becomes large enough. A sample of such a list is shown to the right. Clicking on the "Snapshot Name" for a snapshot will bring up the board18SnapMap page for this snapshot. You can use this page [and the associated board18SnapMrk page] to resolve questions about the progress of the game. The board18SnapMap page displays a snapshot of the game board. This page cannot be used to modify the game. The board18SnapMap page does not support keyboard shortcuts or right click context menus. The main menu for the snapshot game board is similar to the main menu for the game board. Clicking on MENU and Hide/Show hides the tokens and tiles on the map or re-shows them if they are hidden. Clicking on MENU and Stock Market causes a shift to the snapshot stock market page. Clicking on MENU and Return to Snap List causes a shift to the snapshot list page. Clicking on MENU and Return to Game causes a shift to the game board page. Clicking on MENU and Main Page causes a shift to the main page. This effectively exits the game. Clicking on MENU and Log Out causes the user to log out of board18. This effectively exits the game. Clicking on MENU and Help causes this Player's Guide to be displayed in a separate window or tab. Clicking on MENU and Close Menu performs no menu action but causes the menu to close. The board18SnapMrk page displays a snapshot of the stock market. This page cannot be used to modify the game. The board18SnapMrk page does not support keyboard shortcuts or right click context menus. The main menu for the snapshot stock market is similar to the main menu for the game board. Clicking on MENU and Map Board causes a shift to the snapshot map board page.